With this cold weather, I’ve been dreaming about spring. I’ve also been thinking about what I’ll make when I can use my gas stove again. Besides roasting a chicken, my thoughts turn to slowly stirred risotto using spring’s first vegetables. I’d accompany either dish with a nice glass of white wine. 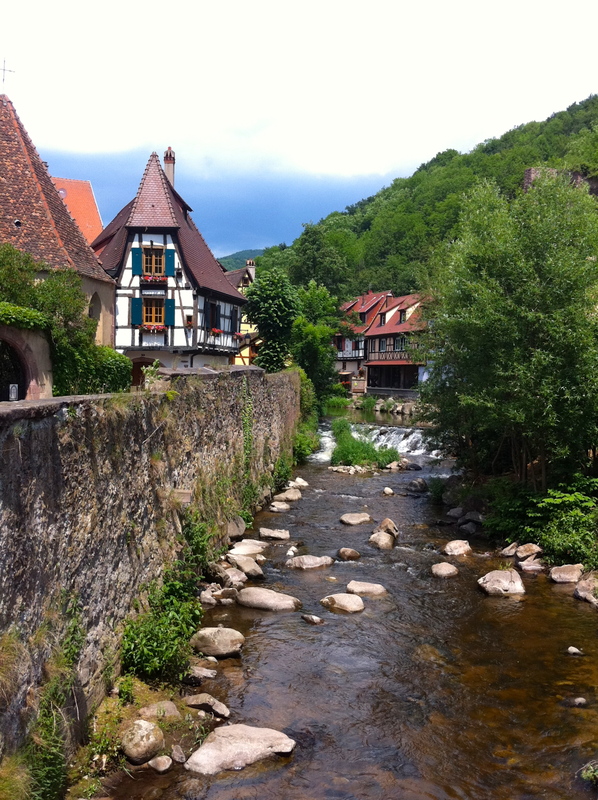 That reminded me of my May 2011 trip down the Route du Vin in France’s Alsace-Lorraine region, which is the inspiration for this month’s travel post. 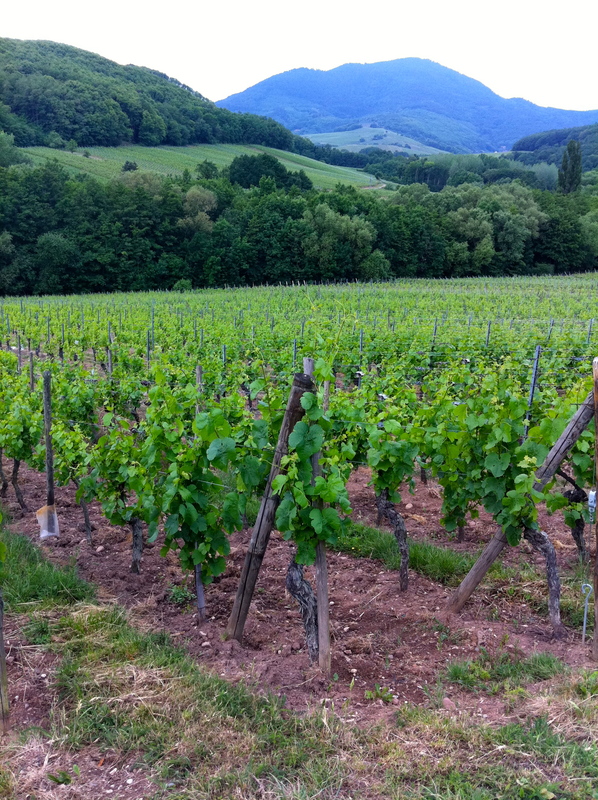 Visiting the vineyards is very different from the Champagne Houses or the California wineries. There are countless places to taste, most of which are generally open to the public without an appointment. Simply drive down the well-marked road from one little town to the next, pulling in to any place that strikes your fancy or when you’re thirsty, then you ring the bell and taste — usually for free. To avoid the masses, opt for the smaller vintners. There’s something special about tasting wines that aren’t typically exported, which means you can’t buy them outside of Europe, let alone France. If you don’t like spontaneity, are concerned with consuming too much while driving, or need to have a firm plan, I’d suggest a tour. But for the rest, it’s an adventure. And even solo travelers can have a great time, since you can truly set your own pace and won’t feel awkward being alone. 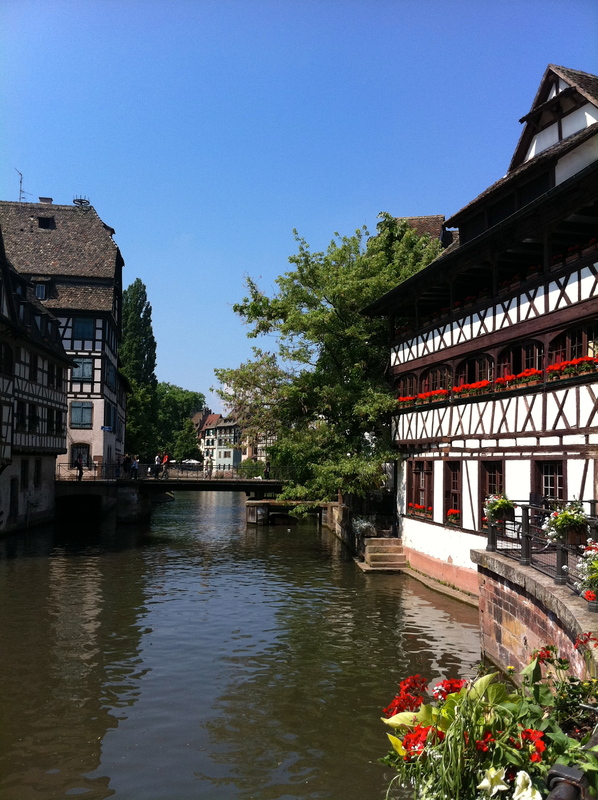 Most use Strasbourg as a base and drive south to Colmar, but you can certainly go in the opposite direction. Neither city is a place to taste, but either will make a great base. 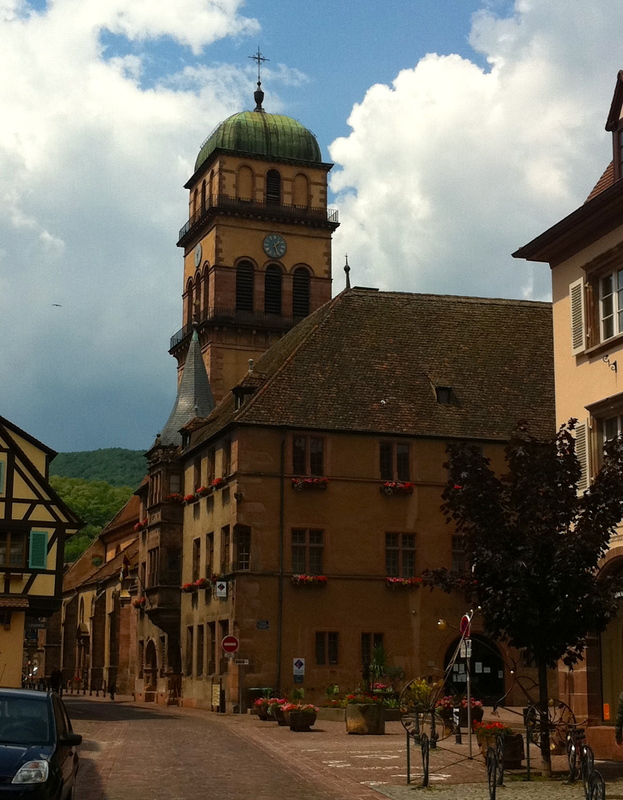 Although the trek from Strasbourg to Colmar is only 70 km, it can take hours or days depending on your itinerary. 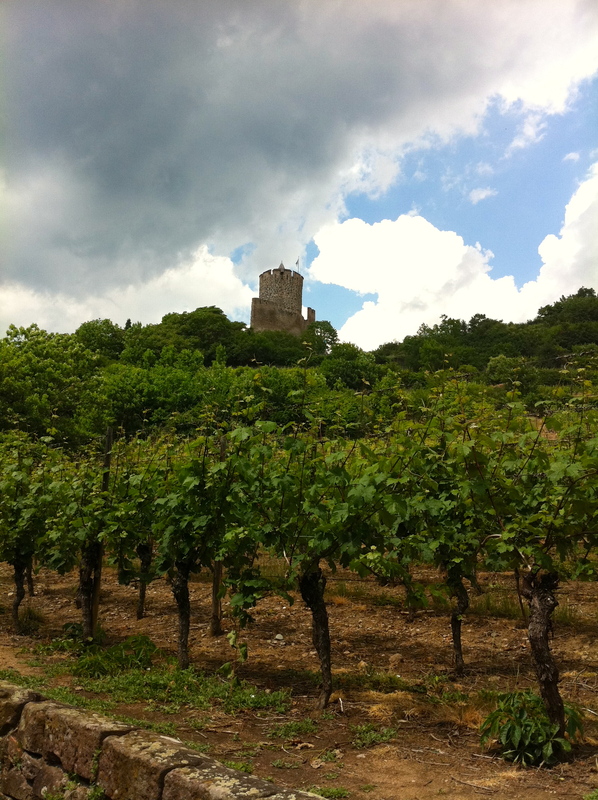 If you have time to spend a couple of days on the wine route, I’d suggest finding one of the smaller towns to stay in along the way or maybe a castle if you book in advance. I’m fairly certain that it’s almost impossible to stop in every little town and even come close to tasting wines from every vineyard, but it’d certainly be fun to try … Just watch out for the crazy people who think it’s a good idea to bike from town to town. There are hills and roundabouts. You can dispel any romantic notions that you might have. This is not a fun little ride, unless you have a Smart Cabrio or maybe a motorbike. This lovely town has plenty of sights to see and some serious cred when it comes to dining. Don’t miss the Notre Dame cathedral, which is free but for 3€ you can climb to the top (about 330 meters) to view the whole city. You’ll want to stroll around the city to get a feel for it, especially Petite France, which has cute little canals. For dining, there are several Michelin starred places from which to choose. Despite my jeans and lack of a reservation, I somehow managed to get a late night seating at Au Crocodile and had an absolutely incredible meal. 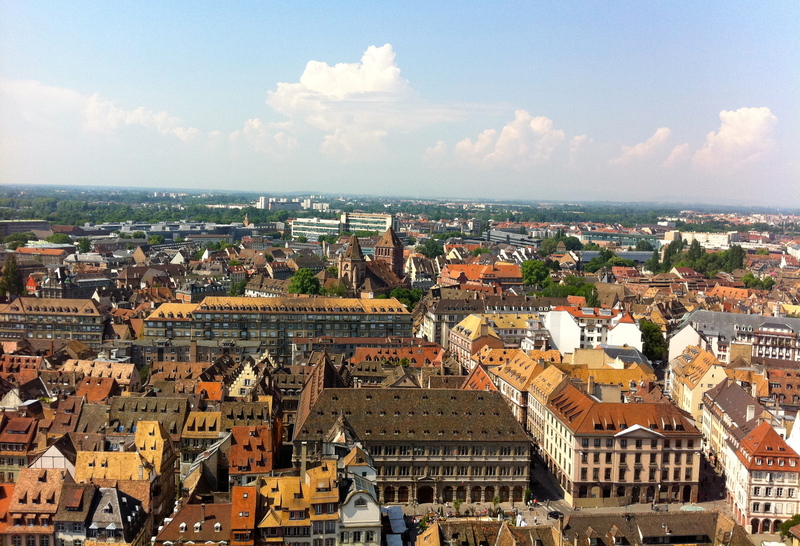 This city is much larger than Strasbourg, but it’s not without its charms. 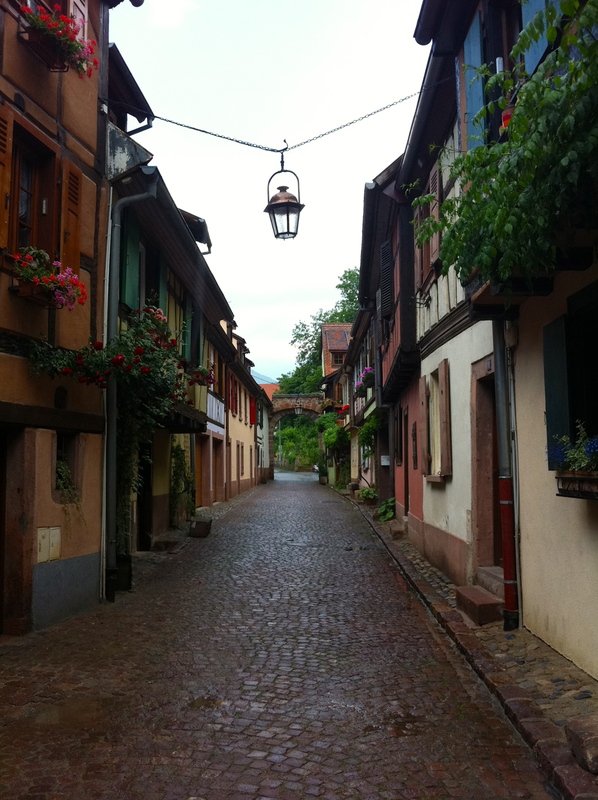 Colmar is called La Petit Venise. Except for the lack of water and one gondola, I didn’t see much basis for comparison to the real thing. Although parts of the town are quaint. 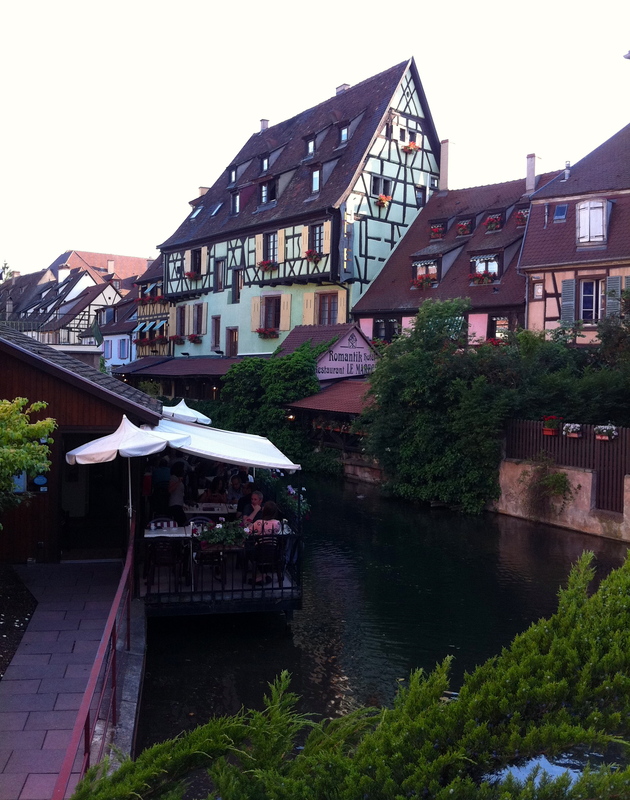 If you spend a night in Colmar, I’d opt to stay at the Marechal, which happens to be on a canal in one of the nicest parts of the town. The must-see attraction is the Musee d’Unterlinden (under the linden trees). 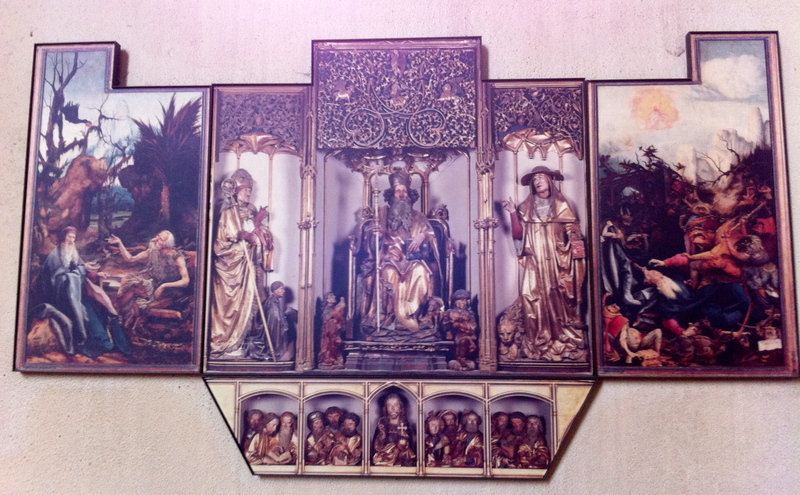 Tourists flock here for the famous Isenheim altarpiece, said to cure people from disease. I thought it was cool looking – kind of like something out of Where the Wild Things Are. The museum also has a few works from Picasso and Renoir, as well as more modern pieces. Definitely worth a visit. The biggest decision you’ll have to make in driving along the Route du Vin will be where to stop — to taste, sightsee and eat — and what to omit. I opted against the larger town of Obernai and instead had lunch with the locals at a little restaurant in the small village of Bernardswiller. After managing to order (English wasn’t spoken), I enjoyed a glass of white, a gratin of the local cheese and a side of salad while sitting outdoors. The food in this region is a bit heavier than elsewhere in France and surprisingly pricier too. 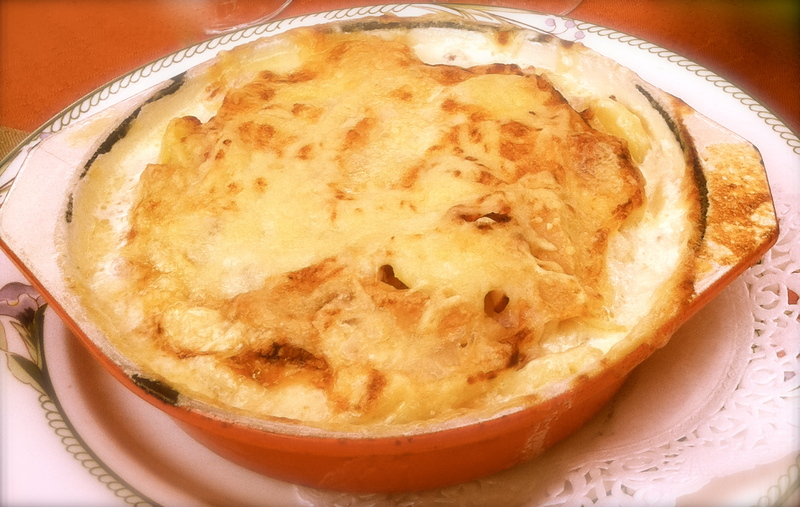 One of the local specialties is tarte flambe´ (the same as flammküchen in Frankfurt), but many places only serve it at night. Try it, if you haven’t already. 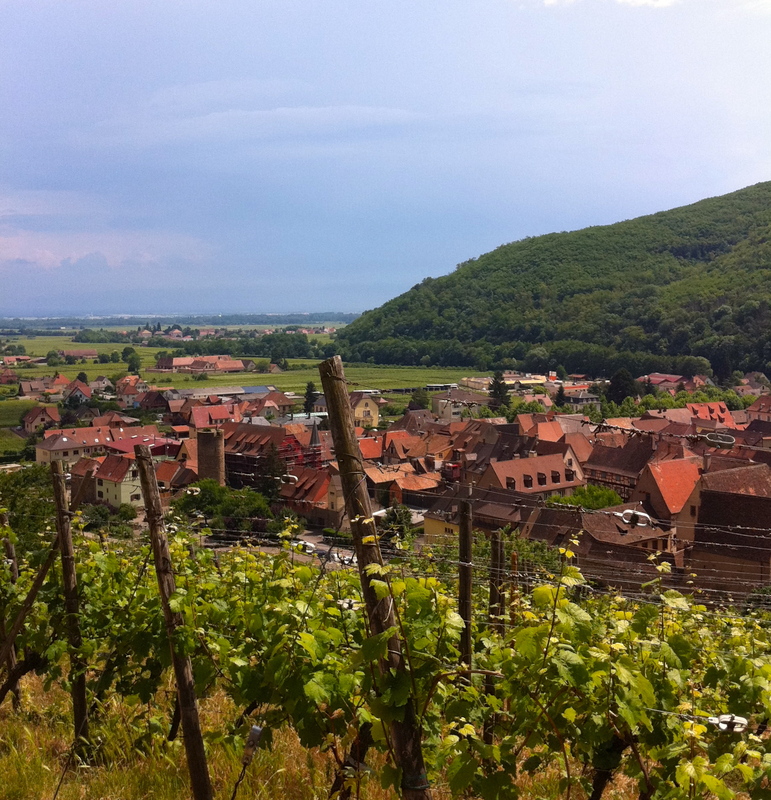 I tasted wines at Domaine Bachert just outside of Heiligenstein and near Barr (got a wine that is only made in this region), then went to Alsace Haegi in Mittelbergheim, and Dopff au Moulin in Riquewihr. 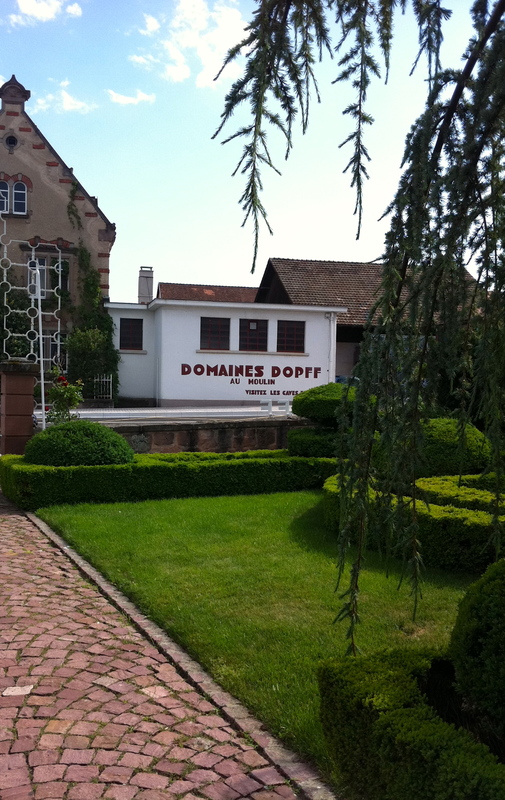 Dopff is bigger than most wineries and exports to the US. 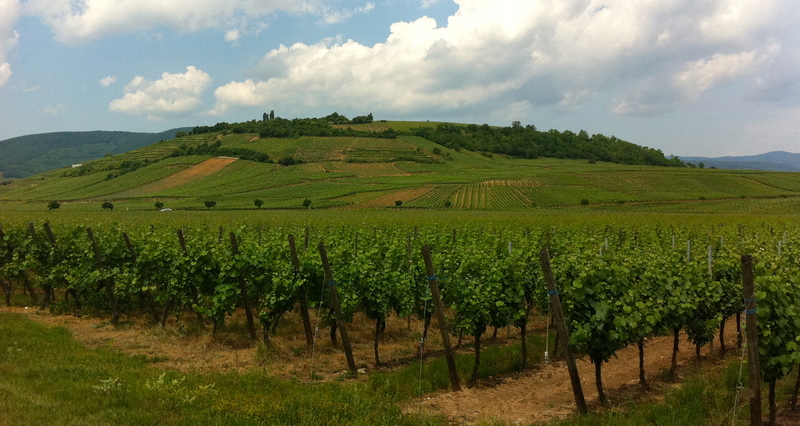 The grounds are quite pretty, and they happen to have some great Riesling. At each place, I bought a bottle or two. I couldn’t figure out if it was obligatory after free tastes, but I liked the wines, so it was an easy choice. 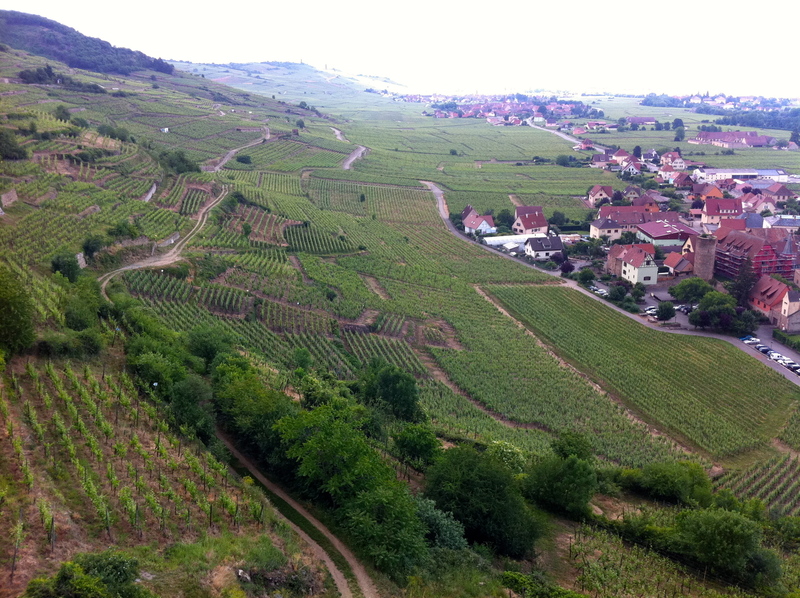 Aside from tasting, you’ll want to check out the little villages. 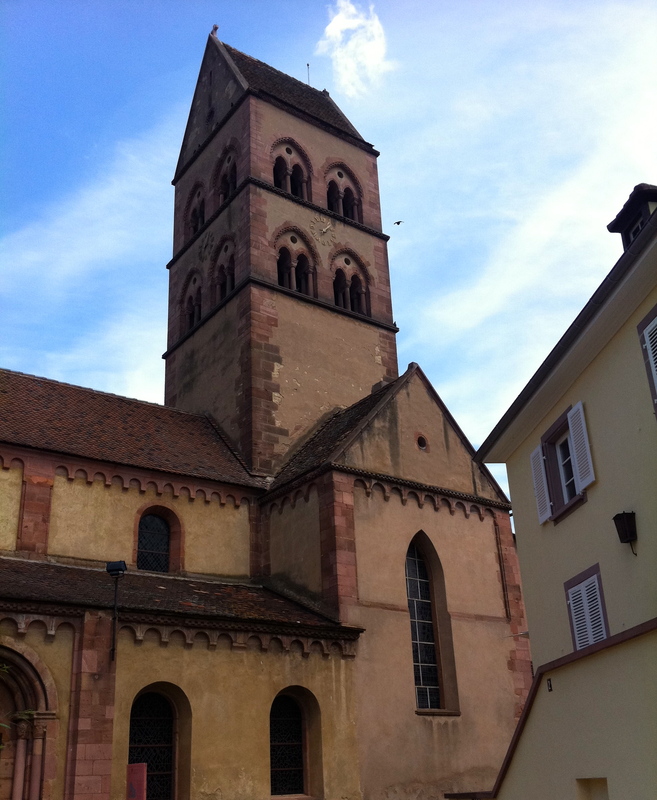 Sigolsheim has a lovely church in honor of Sts. Peter & Paul that dates back to the 12th century. 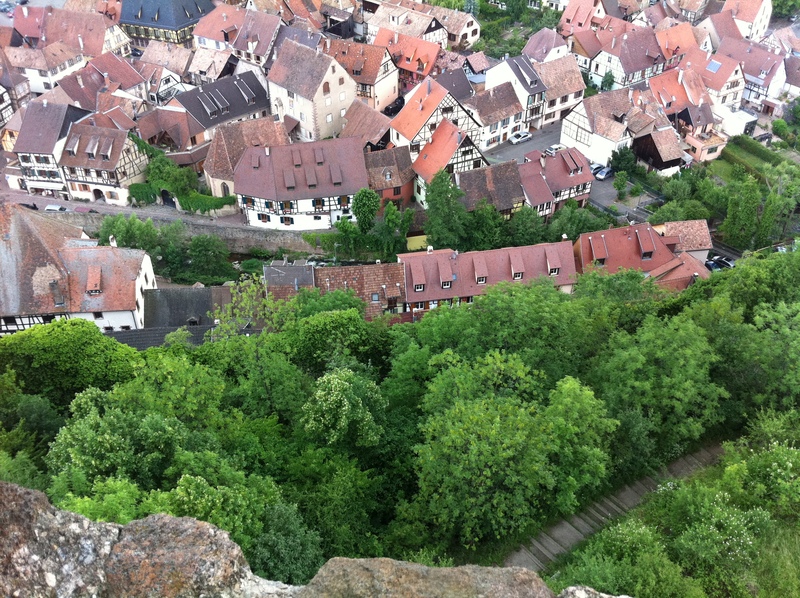 One town I’d suggest as a must is Kaysersberg. It’s a lovely little town to walk through. 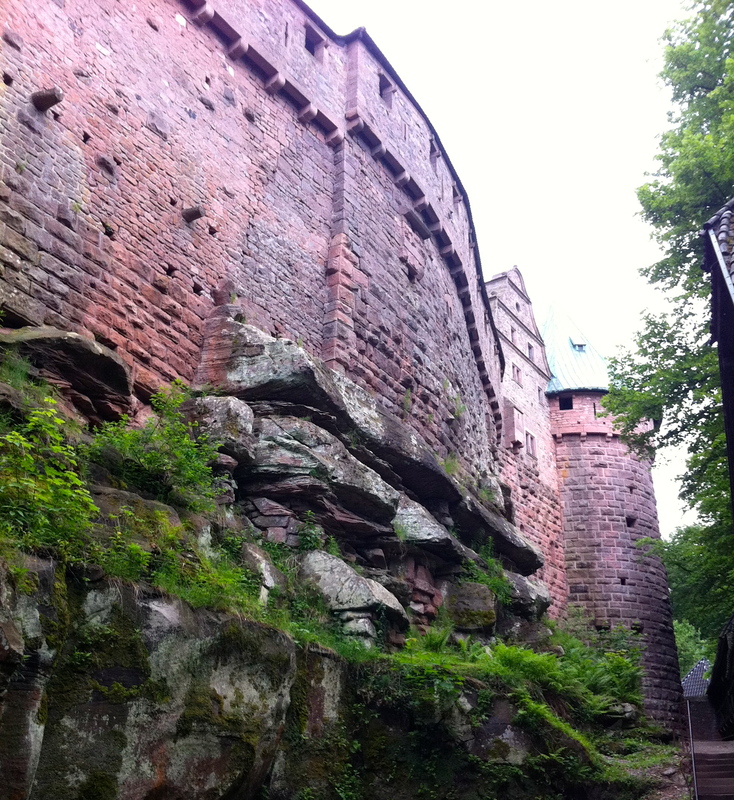 And there are the ruins of a castle. The ivy-covered path can get a little slippery, especially if there’s rain. It’s impossible to describe just how beautiful this area is, and that’s coming from someone who always chooses the beach over the mountains. 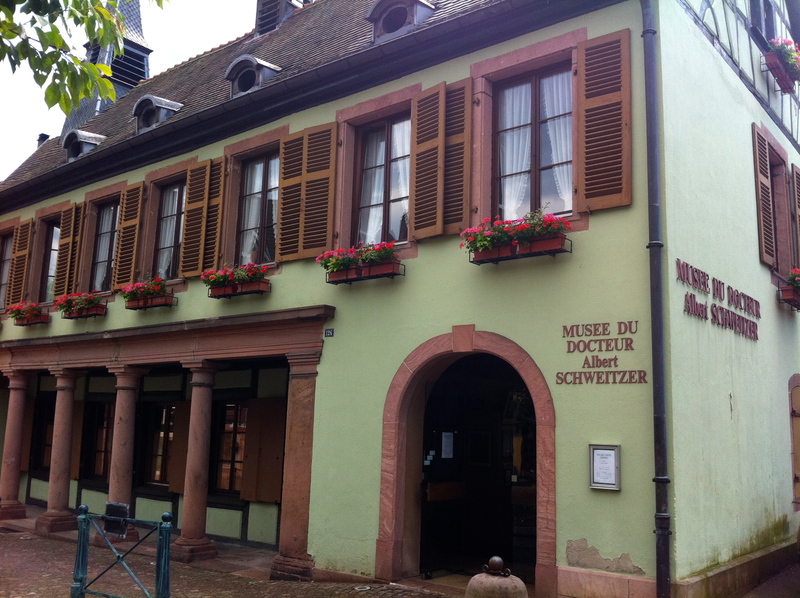 It also happens to be the birthplace of Albert Schweitzer (his house is a museum, and since we share the same birthday I figured I’d check it out). 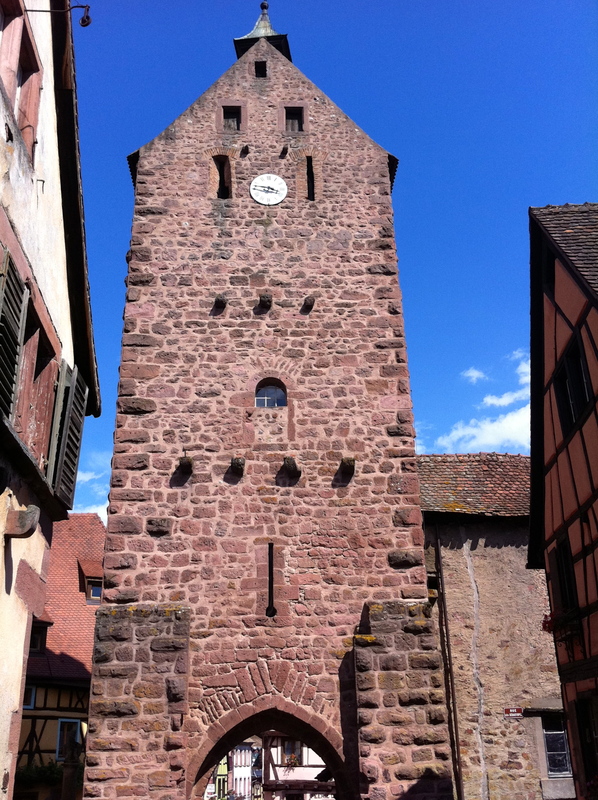 Another nice stop along the way, although a bit touristy, is Riquewihr. Its Tour des Voleurs (Thieves’ tower aka Torture Chamber) unfortunately sounded a lot cooler than it actually was, and now it’s an anti-war museum with minimal info on the horrors that were faced here. 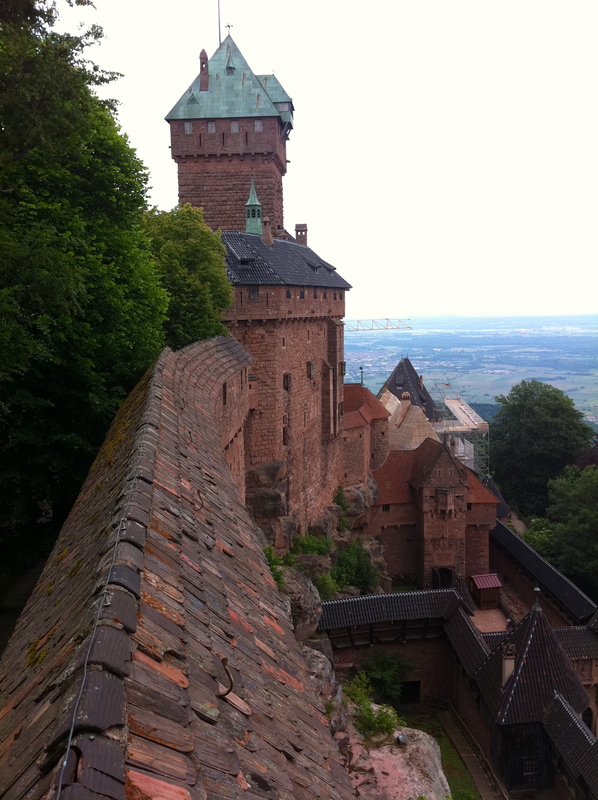 When you want a longer break from tasting, drive through the impressive countryside and up the Vosges mountains to Haut-Koenigsbourg. 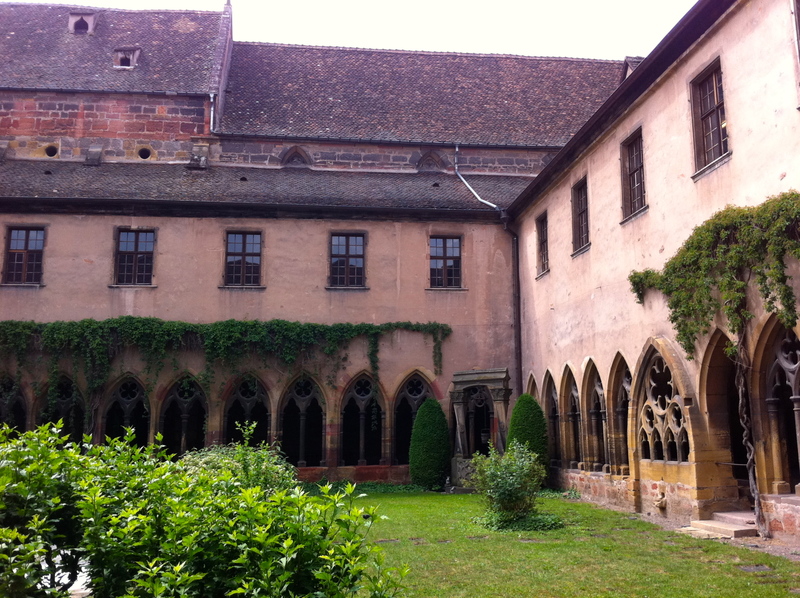 This is one of the few castles that was well-preserved and restored in the early 1900s. 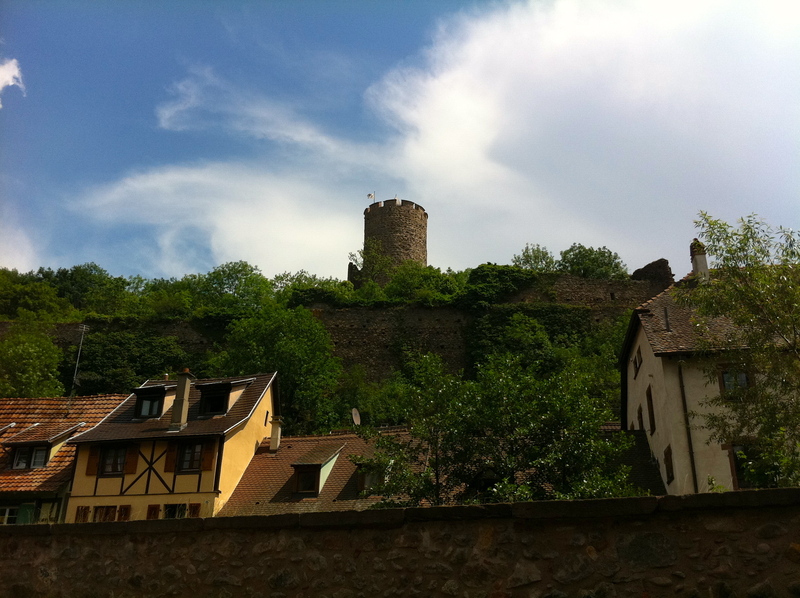 The views are amazing, although I was not impressed with the castle itself. It’s on the must-see list for the area though, and the drive alone is worth the trip.